'Quick, DENIS IT IS HERE'... I waited for him to come and join me as we both sat in our lounge so excited about this moment. We have patiently waited for this very day since the whole process began in August 2012. Mums green bottle found at the rubbish dump got a look in! 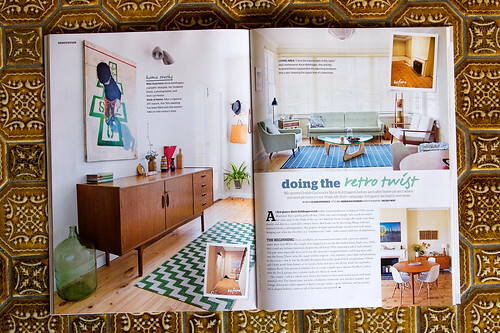 To see our lovingly renovated retro abode featured in Inside Out Magazine is a massive achievement for us! 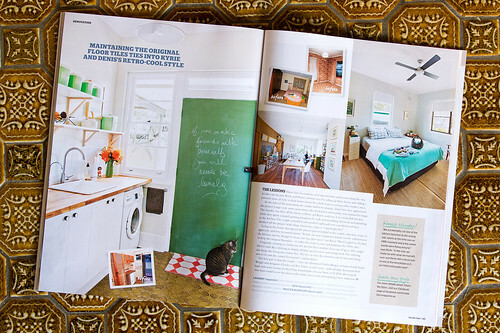 We sat there drooling over the 6 page spread, reminiscing about how much we have actually done to our place within less than 2 years. 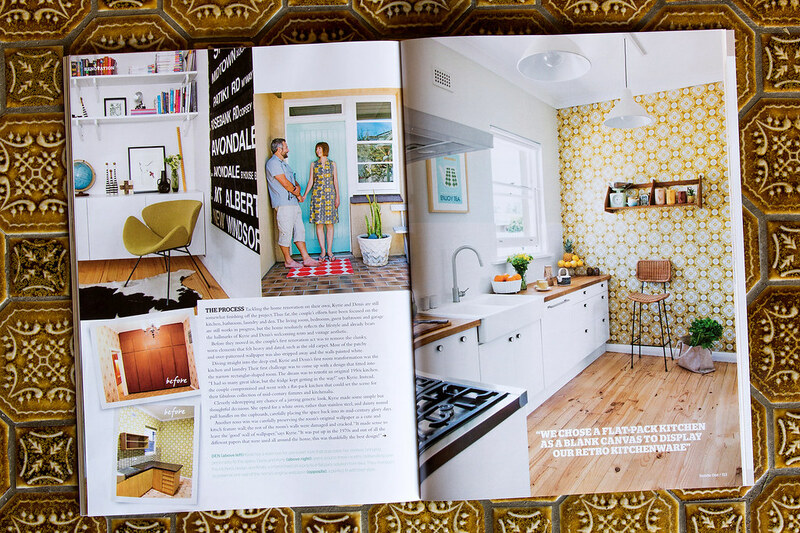 Totally chuffed that our renovation is stylie enough to grace the pages of a glossy interiors mag! Denis and I posing for the camera! It is so interesting to see how an interview translates into a story and how the photos pull it all together. I really love what Clare wrote... she captured our story and the personality of our style and renovation process so well. I particularly like the opening paragraph, and I really do wish I had magical powers like Samantha Stevens from Bewitched! Our little Hestor also did some modeling for us! He has lost a bit of weight since this photo was taken! Anyhow, if you have made it to retrodelights.com.au after reading our story, welcome! We still have lots to share with you, bathroom reno, converting a garage into a photographic studio, and a new master bedroom suite and living area upstairs. Yes we have decided to re-configure our place so the renovations continue! Congratulations! That is so cool.. I'm on a self imposed ban on buying magazines but I'm breaking the rules and rushing out to get a copy. Can't wait to see the rest of the renos. Love your renovations, great to see you are keeping some of the original features of your gorgeous home, they tell a story, and add so much personality ! 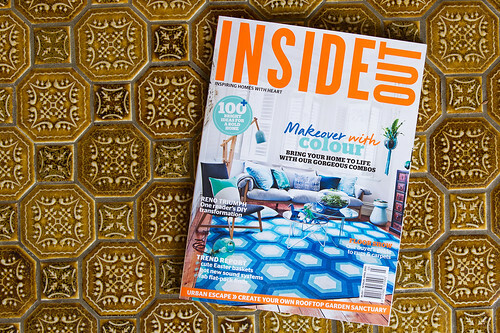 I have just finished reading your article which was featured in Inside Out, and I am so happy that I have found your blog! I am OBSESSED with mid modern century homes, and love me a flat roof house! Love all that you have done so far on the house. I'm looking forward to reading your previous posts, and the future ones too!